Water filtration is proven to reduce wear and to maintain effective heat transfer. This is especially important for coolants that stay in the engine longer. Additionally, water filters can provide a convenient and reliable method for delivering supplemental coolant extenders into the cooling system to improve performance and extend coolant service life. Extended Service chemical filters use a patented combination of slow release chemicals and a diffusion orifice to slowly release chemicals during the extended service intervals. Standard service filters provide a simple and easy way of adding supplemental coolant additives (SCA's) at traditional service intervals with any Fleetguard coolant. 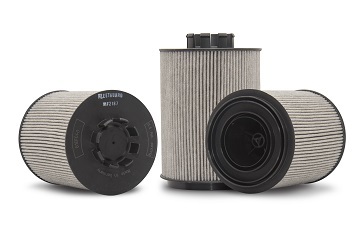 Fleetguard Non-Chemical Filters provide the same filtration protection to your cooling system as the Standard Service Filters, but without chemical additives.